In doing so, he set the first truly long-term single season home run standard, which would stand for 34 years before being surpassed by fellow Yankee legend Roger Maris who went yard 61 times in 1961. The Colossus of Clout virtually created the category when he set his first Major League home run record during the 1919 season when he connected a then unbelievable twenty-nine times with the Boston Red Sox. 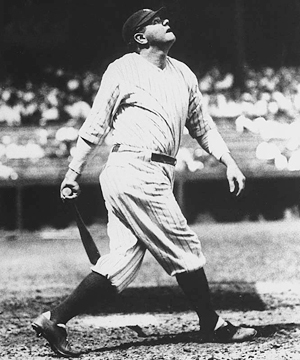 The 1919 plateau was considered at the time an "unreachable mark" until the following year when the Bambino smashed his own record by going deep fifty-four times — then beat that record just one year later when he went deep fifty-nine times. A few seasons passed and the 1920 record seemed safe until 1927, when the Ruth blasted sixty long balls in just one hundred fifty-one games.